A Surprising Treatment For A Rare Chronic Pain Disorder : Shots - Health News Thousands of teens suffer from a rare chronic pain condition that makes everyday life excruciating. Some are trying a counterintuitive treatment approach: Load up on pain until you learn to ignore it. Update 3/13/2019: This story has been updated throughout to include more context that we believe is of service to readers, specifically information about the state of research into pediatric chronic pain treatment, and about how clinicians monitor the safety of patients undergoing the type of treatment profiled here. After the story was released as a podcast on March 8, Invisibilia received numerous audience comments which the show addressed here. Invisibilia, the show about the invisible forces that shape human behavior, is back with Season 5. The first episode looks at pain in our culture through a medical mystery — and a treatment program with a counter-intuitive approach. There's a before, and there's an after. In the before, it was a relatively normal night. The kind of night any 14-year-old girl might have. Devyn ate dinner, watched TV and had small, unremarkable interactions with her family. Then, around 10 o'clock, she decided to turn in. "I went to bed as I normally would, and then all of a sudden ... my hips... they just hurt unimaginably!" Devyn says. "I started crying, and I started shaking." It was around midnight, but the pain was so intense she couldn't stop herself — she cried out so loudly she woke her mother, Sheila. Together, they did everything they could to neutralize the pain — stand up, lie down, hot bath, pain medication. But there was no escape, not for Devyn, and so not for Sheila. "You go to cancer first, right? It's like, 'OK, maybe you have cancer, maybe it's a tumor?' " Sheila says. When she was calm enough to reason with herself, Sheila decided cancer was improbable but wondered what was going on? The only thing they could think of was that the hip pain was somehow related to the minor knee surgery Devyn had gotten a few months before — she had broken the tip of her distal femur one day during dance practice. They started by calling Devyn's surgeon, but the surgeon had no explanation for the pain. He renewed Devyn's prescription for Percocet and wrote a new prescription for Tramadol. But the pain only got worse, so they lined up more appointments: their pediatrician, a naturopath, a pain specialist, a sports medicine doctor. Every doctor's visit was the same. The doctor would ask Devyn about her pain: Where was it, and what was her pain number on a scale from 1 to 10? Then the doctor would order some tests to find the pain's cause. But no matter where the doctors looked in Devyn, all they saw was a perfectly normal body. "You are healthy. Nothing is wrong." Those are the words the doctors said to Devyn and Sheila over and over again. It made no sense. And it felt, paradoxically, like the more attention they gave to the pain, the bigger the pain grew. "It spread from my knee down to my entire foot, the whole bottom half of my leg, to my right leg, to my right arm. My entire arm, to my shoulder, to my left hand and then my whole left arm," says Devyn. "Pain just took over. Sometimes I couldn't wear pants, I couldn't wear socks, I couldn't have the covers on my leg. Sometimes I'd have to turn the fan off, because the fan being on would hurt my leg." Of course, Sheila was horrified and frustrated, she had always been able to navigate Devyn's problems before. Sheila says she was never a helicopter parent but she was quick to help. She always did whatever she could to make Devyn's dreams a reality. When Devyn was little, she focused on gymnastics, but at 12, she discovered dance and it was like a revelation. Devyn loved the way she felt when she moved. Unfortunately once the pain hit, Devyn had to stop dancing. Pain was the focus now, it came to completely dominate both Sheila's and Devyn's attention. "I was constantly thinking ... 'How's my back feeling? How is my other leg feeling? How is the part that it just spread to feeling? And how am I going to handle it, if it spreads further?' " Devyn says. Devyn withdrew from her public high school because there were days when her body throbbed so badly she could hardly leave her room. In fact, Devyn stopped going out even to short social events with family and friends because if someone bumped her or tried to shake her hand, her pain would flare and she would feel like going home. Eventually their lives became so unrecognizable that they and the people around them actually began to question their sanity. "I remember one time when we were sitting in the doctor's office, and they basically just said to Devyn, 'You know you need to work really hard on your psychology' ... and I thought, 'Maybe we're both crazy!' " Sheila says. But here's the thing: They weren't the only ones who were facing this problem. There are lots of teens like Devyn. The term acts as a kind of umbrella for a variety of diagnoses (like complex regional pain syndrome), none of which are yet well understood, particularly in children. What is clear is that for most of these kids, the pain can't be fully explained by a current injury or infection. For some kids, their pain seems to emerge after an injury, but it continues and grows long after the injury is healed. And doctors who treat it think the pain comes from an overly sensitized nervous system. The normal purpose of pain is to act as a warning sign — it tells you to take your hand off the stove. But the doctors who treat children like Devyn think something has happened to make these kids' brains and nervous systems go haywire and start seeing threats everywhere. For these children, it could be that even normal stimuli — like the breeze from a fan — is amplified and interpreted by the brain as an attack. That could be why Devyn felt pain even though no test found any problem. Her brain was stuck on the wrong setting and couldn't stop paying attention to the signals it was receiving. For pain, the go-to move in American medicine has been prescribing painkillers — but that doesn't typically solve the problem these children have. Now, a small group of doctors across the country have developed an unusual approach that they say is working for some patients. It doesn't work for everyone, and the research has a long way to go to prove that it's effective — but it offers an intriguing alternative treatment, and it starts from a different way of thinking about pain. Dr. David Sherry, a pediatric rheumatologist at Children's Hospital of Philadelphia, has gray hair long enough to gather in a ponytail, a massive number of aggressively playful ties, and a very unconventional, somewhat alarming attitude toward pain. For Sherry, the way you think about and approach pain is a critical part of the physical sensation you experience. And he believes that since the 1990s, our society has focused way too much attention on aggressively relieving pain. Sherry says pain used to be more accepted as a normal and predictable part of life. He thinks that the way American medicine now routinely asks patients to rate their pain on a scale of 1 to 10, and treats it like an emergency, has led to more pain in our society: More doctors confronted with kids like Devyn, and more adults complaining of chronic pain. He thinks the more attention you pay to something, the bigger it becomes — because the very act of paying attention to something reinforces connections in the brain. So to help kids like Devyn, Sherry and a handful of other doctors with this approach want to teach them to stop paying so much attention to pain. Which is why Sherry has concocted an unusual treatment for these kids: "Put them in pain to get them better." If you force the kids to push their bodies until they are in tons of pain, over time, their brains can learn to ignore it, according to Sherry's hypothesis. He has a clinic at Children's Hospital of Philadelphia where he treats about six kids with amplified pain at a time. He has tracked his patients and says he has seen a lot of success; he published a small study showing that 45 out of 49 patients had remained symptom-free for two years. His specific approach hasn't been validated by larger, controlled trials. But other programs have similar, though typically less intensive, protocols that have been researched. Often called intensive interdisciplinary pain treatment, the programs typically put patients through a multi-week course of daily therapy, including a mix of physical therapy and psychotherapy, to help them learn to cope better with pain and re-engage with the activities that are meaningful to them. Interdisciplinary approaches have been shown to be effective for some chronic pain complaints among adults. And among children, a 2015 review study and a 2018 review study of intensive interdisciplinary treatments showed positive results in function, and to a lesser degree, in pain. However, the studies included in the reviews are small and researchers emphasize the a need for more trials. Dr. Chad Brummett, a pain researcher and anesthesiologist at the University of Michigan, says it can be hard to do research on treatments for chronic pain for several reasons. There are often many factors that contribute to patients' pain, and by the time they enroll in trials, they've likely seen many doctors and may have bias toward certain treatments. And patients often move or switch doctors so it's hard to follow them over time to assess the long-term success of programs. Still, Brummett says it's reasonable for patients who haven't found relief elsewhere to try intensive interdisciplinary programs. 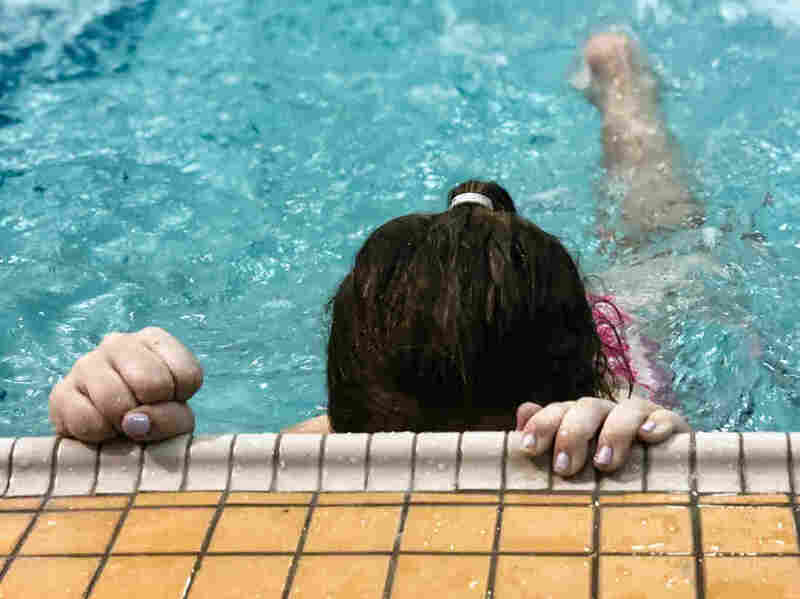 Doctors always have to weigh the likely harms and benefits of any therapy they recommend, he says, and for some kids living with near-constant pain, the cost of not participating may be worse than trying a therapy that's still being studied. Sherry's intensive version of this treatment is not for every patient, and in fact, a portion of patients don't do well; they drop out or don't benefit in any way. But many families with these problems have tried and failed at other treatment options. And as unpleasant as it sounds, for them, this approach seems worth trying. About eight months after Devyn had woken writhing in pain, she and Sheila still had no solution to Devyn's problem. They had tried physical therapy, medications, even hypnosis. Then one of the many specialists they went to see suggested Devyn might have amplified pain. She remembers coming home from the doctor and getting on her computer to research this syndrome she had never heard of. Because of amplified pain, one patient was not able to unclench her right hand. "The very first video I clicked on, it was a girl, probably around my age, and she could not function at all," Devyn says. "She had cabinets full of prescription medication, and there was this one part where she was outside and she was in a wheelchair and a mosquito bit her and she cried like she just got stabbed in the leg. That's how severe her pain was." 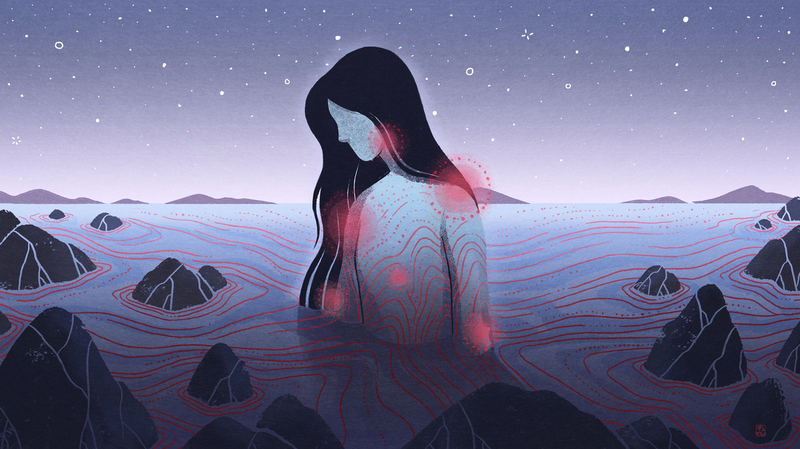 Devyn eventually found an online support group of girls like her with chronic pain, and she found incredible solace in a community of people facing the same set of problems. As the months wore on, she says, she spent more and more time online talking to them. For her part, Sheila was glad to have a diagnosis and glad that Devyn was finding comfort in a new community. But sometimes, in a dark corner of her mind, she privately worried that her daughter's identity was being built around being sick. "You know she's gone from dancer to performer to sick girl ... because right now all her friends are kids with chronic pain," Sheila says. What Sheila wanted was a laser focus on getting rid of the pain and back to normal life. And that was when she found out about David Sherry and his program. So they flew to Philadelphia to meet him, and after a tour of his clinic, they became convinced they should try this approach. "He's definitely a little crazy, but anyone who goes into a profession treating this disease has to be a little crazy and out of the box," says Devyn. Because of scheduling, Devyn wasn't able to go to Sherry's program at CHOP, but she got in to a similar program run by one of his former rheumatology students, Dr. Cara Hoffart, at Children's Mercy Hospital in Kansas City, Mo. Hoffart's program: "Easy, medium, hard"
When Devyn and Sheila sat down for intake with Dr. Emily Fox — one of the doctors at Children's Mercy Rehabilitation for Amplified Pain Syndromes Program — she was clear right from the start: They were going to put Devyn in as much pain as they possibly could. "This may be one of the hardest things that you do physically in your life," she warned Devyn. Devyn was going to do physical workouts five to six hours a day, so it was absolutely going to hurt. But, Fox explained, they were going to studiously avoid talking about the hurt because, "the focus is not on pain in the program — therapists are going to ask you 'Are things easy, medium or hard?' "
Easy, medium, hard. This bland neutral language was necessary because the whole point of the treatment was to draw attention away from pain. So Devyn, her mother and even the physical therapists charged with putting Devyn in pain should avoid speaking the word "pain" out loud whenever they could. In addition, pain medication — even medication for related problems, like nausea, shouldn't be used. Nothing to mask the hurt and difficulty: Devyn had to experience it straight up. Fox looked at Devyn and Sheila with eyes that were serious and sympathetic but firm. If Devyn followed these rules, nine hours a day, five days a week, for three to six weeks, she said, she thought Devyn's pain would ease. But it wasn't going to be easy. Pain was how Devyn would be treated for pain. There are other programs across the country that share some of the same principles though few are as intense as Hoffart's. One similar program at Boston Children's Hospital is run by Dr. Christine Greco, a pediatric pain specialist, and Deirdre Logan, a psychologist. They also treat kids with chronic pain, using a combination of therapies, including intensive physical therapy, which is typically painful for patients. They say causing kids to experience pain is not the focus. "Really the focus is on getting kids functional again," says Greco. They measure success not in terms of lessened pain, but in terms of kids getting back to activities they want to do. Before patients get started in the program, the therapists make sure the participants don't have an underlying injury that could be worsened by treatment. Then, Logan says, the therapists get the families ready for the pain their child is about to suffer, explaining that there's a "difference between hurt and harm." "We try to tell families that is very real pain that they're experiencing. But it is not any longer a signal of ongoing tissue damage," say Logan. Hoffart agrees that restoring function is the top priority, but the intensity of her program and restrictions on pain medications can make the treatment feel even more daunting. Though it can be grueling, Hoffart says they are rigorous about protecting their patients' physical and mental health during treatment. Hoffart says they are careful to only accept patients in the program who they think can benefit and who have already tried outpatient treatments without success. And they only accept teens who want to do the program themselves, not because of parental pressure. 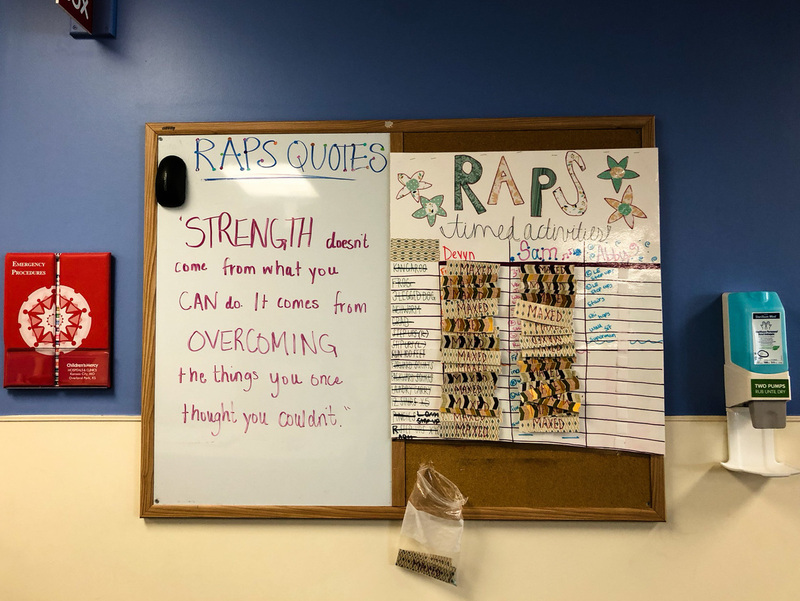 Before they start, patients are asked to work with outpatient physical or occupational therapists on physical goals and a counselor to address overall stress management. And she says, they "bring in a lot of things to support emotional health in the program," including counseling, expressive therapies and self-regulation skills. She says physical therapists in the program are trained to take extra precautions with patients who have other underlying disorders that contribute to their pain, including arthritis, hypermobility or Ehler's-Danlos syndrome, a rare disorder that affects connective tissue, including joints. For these kids, she says: "We make sure they are protected and we tailor the program to each individual person and their needs and make sure that we're not pushing beyond what they should be doing." There are critics of the intensive rehabilitation approach. Some clinicians think that intensive physical therapy could be harmful, especially if a patient has another condition — diagnosed or undiagnosed. Dr. Pradeep Chopra, a pain specialist at Brown Medical School, says he's seen a number of patients who haven't done well with what he calls the "bootcamp" approach of intensive rehabilitation treatment programs. He says some of his patients have other underlying diagnoses that need to be treated, such as connective tissue disorders or autoimmune conditions. He tailors his approach to each patient, working to manage the patients' pain with various medications — though, he says, he rarely uses opioids — and prescribes them targeted physical therapy to strengthen and support their joints. Although he agrees that pain can and does get "magnified" in the nervous system — he prefers the term central sensitization to amplified pain — he thinks doctors still need to treat the underlying issue that's causing it. He says there's not just one way to treat chronic pain. "You have to look at chronic pain as an individual condition," he says. "It's like asking someone: 'How do you treat back pain?' Now, your back pain could be from a cancer growing, or it could be a muscle sprain. The treatment would vary widely." 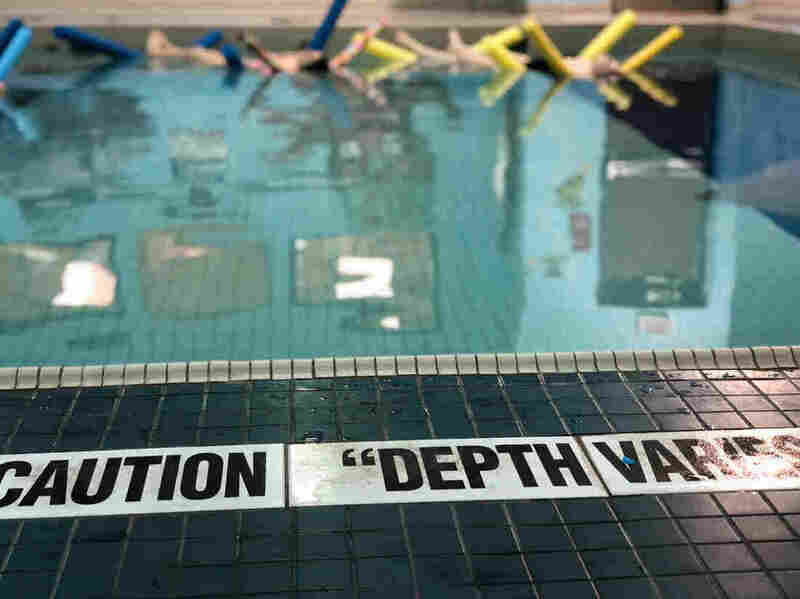 Days at the Children's Mercy pain program begin at 7:30 a.m. with an hour of exercise in the hospital pool. One day during Devyn's treatment, the physical therapist led Devyn and two other girls through a routine. The air in the pool room was hot, making the girls excruciatingly uncomfortable. Because of their amplified pain, the girls' skin is so sensitive that even a cool breeze could feel like someone was holding fire to their body. At Children's Mercy Amplified Pain Syndrome Program, patients start most days with an hour of intense therapy in the hospital pool. After some laps, the physical therapist brought out a stopwatch and told them to get out of the pool and jump back in as fast as they could. So that is what they did. They jumped in the pool, then turned back to the edge and pulled the full weight of their body up by their arms. Then they did it again, and again. It went on for five minutes, each of the girls struggling to do the task over and over. One of the girls had lost the use of one side of her body — which sometimes happens with amplified pain — so it was especially hard for her. She was mostly using her good arm; she still tried to throw her other elbow over the edge of the pool to help, only it kept on slipping. After swimming, Devyn moved into a full day of exercise. Her first activity was to perform a series of jumps with her arms stretched overhead. Devyn started fine, but about 30 seconds in, she began to have an asthma attack. Her breathing got more and more labored, until she was gasping, struggling to get the air she needed. Later, when Devyn got a nosebleed, the therapist signaled her to continue with her workout. Again, she did not want Devyn to linger over the problem, to give more attention to pain. So Devyn did push on. And through it all, her attitude never seemed to waiver from a cheerful can-do. As far as Hoffart can tell, there are very few other pain programs in the U.S. besides Children's Mercy that refuse to bridge pain with medications. But her view is that meds are sabotaging in cases of amplified pain. 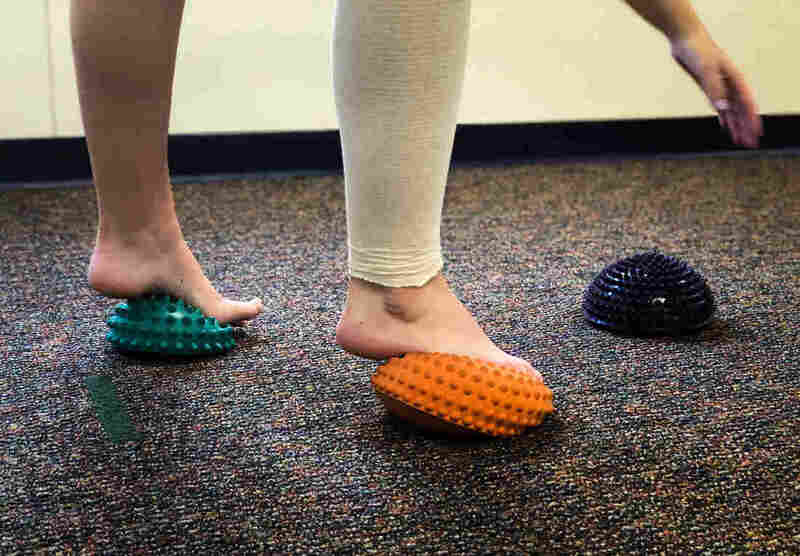 In the amplified pain treatment program at Children's Mercy, patients spend hours a day doing uncomfortable exercises with the idea that they can gradually retrain their nervous systems to be less sensitive to pain. "I am asking a teenager to do an incredibly complex, challenging, hard treatment approach, and most of my patients will tell you this is their last resort," she says. "And if they still are holding out that maybe some medication is going to save them or fix this, it's really hard to give your all to something that sounds so hard and challenging. And so you kind of have to be all in." In a sense, what the program is trying to do, Hoffart says, is to slowly, laboriously retrain the brain. That's why the children have to be in so much pain for so long. Because of their past behaviors, Hoffart says, she thinks their brains have been trained in the wrong way. She gives the example of walking, which for these kids can actually be a painful activity. And if you quit walking because of the pain? "Your nerves just heard from you that walking is dangerous because you stopped. So next time you start walking, they'll remember that... you actually just empowered them to send more pain signals," she says. The alternative she wants for her patients: Keep walking even though it hurts. "If you keep walking, your nerves are essentially getting the message of, 'Well she's still walking [so] this must not be dangerous. Why are we firing?' and then, as I tell my kids, they'll get bored and stop firing," she says. So that's what they're trying to do: Bore the brain into submission. That's also why they avoid the word "pain." When a kid is asked about their pain, Hoffart says one way to think about what happens is that the brain must take an inventory — run through the body checking —and that refreshes all the nerve connections. Again, she speculates, that is the problem with paying too much attention to something. But boring the brain is a big job, so they can't just work with the kids. They need the whole world around the kid to change, too. So they also have therapy for the parents. Dustin Wallace, the program's lead psychologist, has a very clear message for the parents: Once they go home, avoid the topic of pain with their kids but also with their adult friends and family outside their home. He bases this advice on his belief that attention moves through networks of people, infecting everyone and changing how they act. "The people that are in your lives are often in your kids' lives. They're parents of your kids' friends, they're your kids' relatives, they're in your town or network. And so you don't want them to see your kid through this lens, because it will color their behavior," Wallace explains. Sheila takes Wallace's words to heart when it comes to Devyn: "I think as a parent you always teeter on the edge of 'Am I enabling?' or 'Am I supporting?' " she says. But while the program is premised on the idea that there are problems associated with the increasing amount of attention our society pays to pain, the answer, Wallace says, isn't to reinstate the pure grin-and-bear-it approach of decades ago before pain became more widely treated. Wallace believes that when you're unable to name and think about your emotions and don't have the tools to diffuse them, whatever stress you experience is directed at and absorbed by the body. That's an important part of the problem with these girls, Wallace says: They're not in touch with their feelings; they just plaster on what the program calls an "I'm fine" face. So, Wallace says, one way to understand what's happening to them is that their nervous systems go haywire because they don't have the sophisticated emotional skills they need to manage in an increasingly stressful world. "What the world expects today of everybody, but in particular coming down to our kids, is so much greater, so much faster, so much more all-day-long, that they are facing far more stress, more hours of the day," he says. So in the treatment, when the kids are going through their exercises, before and after many of the activities, their trainers ask them for a word that describes how they are feeling. They also complete worksheets and diary entries so they can learn to better articulate their inner thoughts. They're taught breathing exercises, and the program gives the patients both individual and group therapy. At the Children's Mercy amplified pain program, patients track their progress on a board. When their physical therapist determines that they have completed each activity to their fullest potential, a "maxed" label is placed on the board as a celebration of their accomplishment. Wallace says kids should have the ability to explore and manage the thoughts and emotions that they need to struggle with, but should also know when — especially in the case of pain — it's going to serve them better to release those feelings and move on. After three weeks of treatment, it was the last day for Devyn, and everyone gathered in the gym so Fox could hand her a certificate of completion. Just before she left, Fox asked Devyn her official pain score so she could put the closing number on her chart — and Devyn answered "6." In other words, Devyn was still in a lot of pain. But that was apparently normal. Fox told Devyn that if she kept up all her exercises and kept on pushing through, the pain should dramatically diminish within a year. So that was the hope as Devyn and Sheila waved goodbye and loaded themselves into the car to drive away. And about a month after the program ended, Devyn reported her pain had gone down a lot. Devyn says that some days it's at a zero. Not every day, but sometimes. For both Devyn and Sheila, it was an incredible relief. Devyn even went back to dancing. This story is adapted from Invisibilia Season 5, Episode 1. Leena Sanzgiri and Carmel Wroth provided additional reporting for the Web version of this piece.